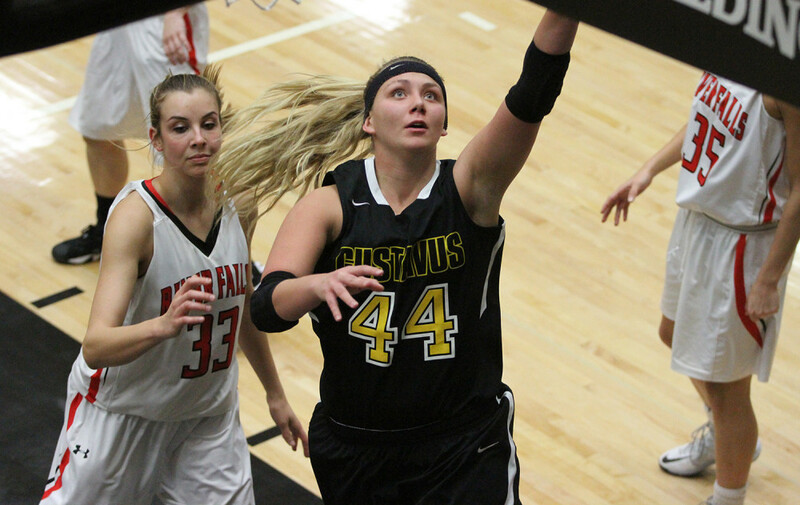 ST. PETER, Minn. – After opening its season with two straight victories, the Gustavus Adolphus College women’s basketball team suffered its first loss on Saturday when it fell 76-61 to the University of Wisconsin-River Falls on Gus Young Court. The loss drops the Gusties to 2-1 on the season, while UW-River Falls stays perfect at 4-0 in 2015. Gustavus only led for 13 seconds of the game, and that was thanks to a Justine Lee (Fy., Dawson, Minn.) three-pointer just 43 seconds into the first quarter. From there, it was all Falcons, as they quickly took a nine-point lead by the 3:33 mark of the first quarter. However, the Gusties fought hard and kept the game within reach, trailing the visitors by only one with 49 seconds remaining in the first half, and went into halftime down 31-28. UW-River Falls began to pull away midway through the third quarter, taking an 11-point lead with 3:14 remaining. The Falcons maintained that lead going into the fourth and despite a late push from Gustavus, was able to convert on two key three-pointers in the final five minutes that sucked any life out of the Gusties that remained. Gustavus shot 38.2 percent from the floor, including a 35 percent mark from downtown, but only converted on 60 percent of its free-throw attempts. The Gusties also struggled to maintain possession, as they reached the 20-turnover mark for the third game in a row. UW-River Falls tallied 11 turnovers. Lindsey Johnson (Sr., Edina, Minn.) paced the Black and Gold offensively, scoring 15 points off 4-of-8 shooting, including going 6-for-6 from the free-throw line and adding six rebounds. Mikayla Miller (So., Goodhue, Minn.) was next with 13 points and six rebounds, and Hannah Howard (Jr., St. Paul, Minn.) added nine points and nine rebounds, with seven of those boards coming on the offensive end.